Our Daughter, Hannah giving Maggie some Lovin'! Welcome to Tickled Pink Labradoodles! My name is Klint Hull. 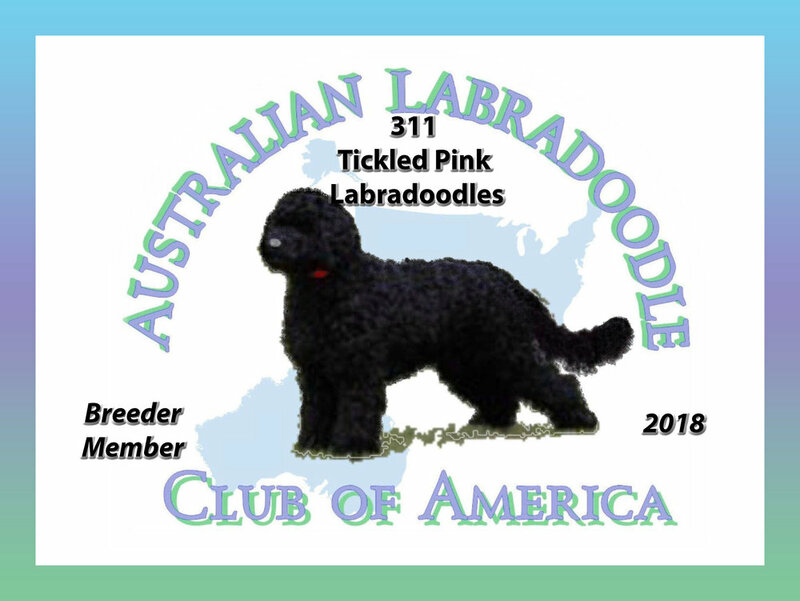 I, along with my wife, Amber, and three little ones, started Tickled Pink Labradoodles in 2017. The idea for Tickled Pink arose after trying to have two dogs as our family pets, but having to eventually re-home the two dogs due to allergies and asthma. Amber is allergic to dogs, cats, and also suffers with asthma, and our youngest son, Weston, also has asthma and other respiratory issues. I got a start raising animals at a very young age. At the age of 6 my family bought our first Australian Shepherd, Sadie. From that moment on, I can call myself a dog-lover! My family raised quality AQHA quarter horses and APHA paint horses. We showed our mares at the highest level earning World and Reserve World Championships. After putting a great show record on these horses, we turned around and bred them to the top stallions across the country. Some of their offspring went on to become multiple World Champions themselves. All the while we were perfecting our equine breeding program, we started raising Miniature and Toy Australian Shepherds. I purchased my first female for breeding purposes at the age of 14. My mother taught me at a young age to focus on raising only the highest quality vs making a profit. That has stuck with me throughout the development of my breeding program as well. Now that Amber and I have started a family of our own, I wanted to restart my hobby and passion of raising high quality animals. However, this task was difficult due to Amber and our children's allergies and asthma. I knew that raising horses was nearly impossible with our property, and the first two dogs we purchased we had to re-home because she couldn't be around them, The first was a Cavalier King Charles Spaniel, a breed we both have had past experience with and loved. The second, a Yo-Chon, (Yorkshire terrier/Bichon Frise), a breed that claimed to be allergy friendly and non-shedding, which we later found out was not. After having nearly given up on the dream of owning or raising quality animals once again in life, we found Charl at Shadow Mountain Labradoodles. The Australian Labradoodle appealed to us so much in that the breed was not only what we were looking for in being allergy friendly and non-shedding, but also intelligent, quick learning and easily trained, loving, family-oriented and excellent with children, playful and comical, wonderful tempered, and of course absolutely adorable. Our first Austrailian Labradoodle "Maggie" quickly become a huge part of the family, so much that Amber feels like someone is missing when we are out with our three children. We love this breed with all our heart and were having a phone conversation with her original breeder shortly after she arrived and our reply when she asked how things were going was that we were just Tickled Pink with Maggie and couldn't be happier. Thus, Tickled Pink Labradoodles began. We want each and every one of our new puppy owners to have the same reply that we did about this amazing breed. Thank you for considering us for your future family member! Maggie's First Day as a member of the Hull Family! Weston first meeting Maggie, He apparently didn't like the taste of Doodle Tongue!